You can leave comments by clicking here, leave a trackback at http://supervillainous.spiderforest.com/comic/the-best-part-of-wakin-up/trackback/ or subscibe to the RSS Comments Feed for this post. And Happiness. *rimshot* I’ll be here all week, folks. Best part, keeps anyone from drinking from his cup (again). I’ll third it in any case. We’ve already got a running gag. Remember the first time Claw offered Ultimo a drink? That was a great strip (and I liked this one as well, obviously!) but I didn’t think it was a running gag (happening or constantly being referred to over and over again). The following is me explaining myself; please do not take it as me dictating how you should run your strip. I just have a vivid imagination at times, so I already conceptualized something for this. All I (and some others?) were thinking is that it would be hilarious for Claw to constantly do things that seemed “friendly” or at least “polite” but were actually failed murder attempts against Captain Ultimo (whether they are seriously supposed to succeed or deep down Claw knows they won’t work, I dunno). You then later have the option of having them boomerang as Claw eventually; perhaps Claw has to break into Captain Ultimo’s home or office or what have you and its full of death traps. 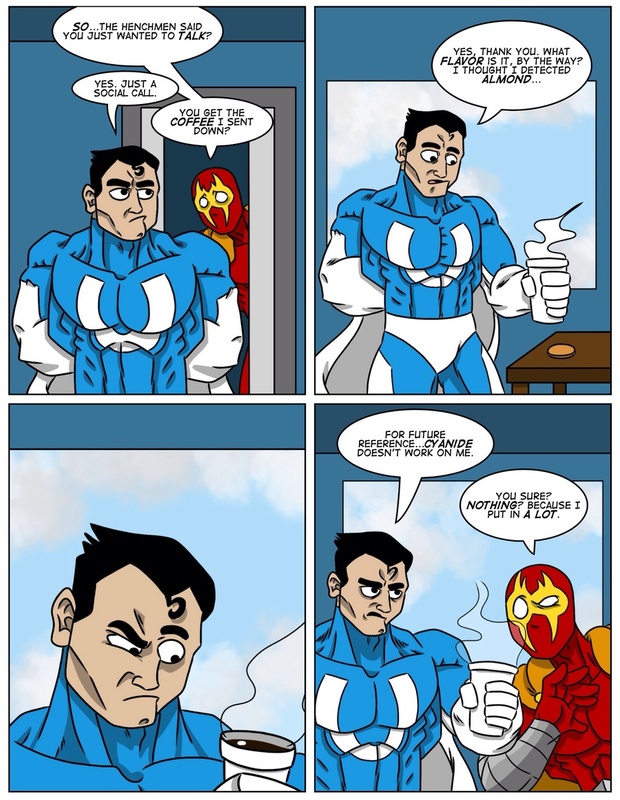 Not intentional death traps, but Claw’s failed attempts at killing Captain Ultimo that lead Captain Ultimo to discover things like cyanide makes a good coffee flavoring for him. This works especially well if it is the minions doing the work. Capt. Ultimo is one of the people who can smell the almond smell of cyanide, huh? Not everyone can. Yet another thing that evolved for who knows what reason only in certain lineages. Ultimo is a man of many abilities. I laughed out loud as soon as I read the second panel.